What size Pipeless Radiator do I need for my room? What size Pipeless Radiator you need depends on many variables, including wall construction and what type of insulation you have. Sometimes though, how much wall space you have and the availability of sockets also factor into what size radiator you can install. The guide above shows the recommended radiator size to heat a room, based on an average UK home with double-glazing. However, you can buy larger or smaller radiators to fit the space you have – if you buy smaller the space will take longer to heat up. Once you have added your Pipeless Radiator to your basket, make sure you now choose your controller below. The RadiWarm is controlled by either a 7-day wireless controller, or the powerful smart controller that allows you to control your heating from anywhere in the world! A feature-rich, battery powered 7-day programmable thermostat offering precise zone control to help to reduce energy costs. An advanced control system enabling you to control your heating remotely over the internet. Buy additional smart controller thermostats for radiators in extra rooms/zones. Multiple radiators can be controlled by one thermostat. Hand-built in the UK, perfect for where safety is paramount including carehomes, nurseries, schools and public buildings – or in your own home. The special Safe Touch casing never exceeds 43°C, which removes the risk of burns or scalds without compromising the heat output. RadiWarm arrives ready for use, filled with specially treated water and fully sealed. They don’t require plumbing, flushing, bleeding or topping-up before, during or after installation. This ensures that the patented built-in boiler gives the same heat quality of a gas central heating system, but without the plumbing, pipe work or even a gas supply. Simply wall-mount the radiator onto special safety brackets, plug it into a standard British electrical socket and switch on. It’s as easy as that. The wireless remote control unit, timer and thermostat, allows you to set advanced programmes for every day of the week. A single controller can work with a number of RadiWarm Pipeless Radiators (within a 10-12m2 radius). Separate controllers are recommended for upstairs/downstairs use. Able to control any number of radiators. Truly wireless, wall mounted and easy to install. Displays target and actual temperature, time and day of the week. 7-day programme with 6 time periods per day. Option to display 12h or 24h clock. Option to display °C or °F. Holiday function – turns the radiator off (frost protection). Boost function – turns the radiator 100% on for between 15 minutes to 4 hours. Advance function – advances to the next programme step. Setback function – turns the target temperature down by 5°C. A single controller can work with a number of radiators (separate controllers are recommended for upstairs/downstairs use). An advanced control system enabling you to control your heating remotely over the internet. The Smart Controller web-based multizone system delivers total temperature control, wherever you are. Using a gateway that plugs into your router your heating can be zoned, programmed and operated from one central point. Use our web-based app through your PC, smartphone or tablet so that you can match your heating to your lifestyle. 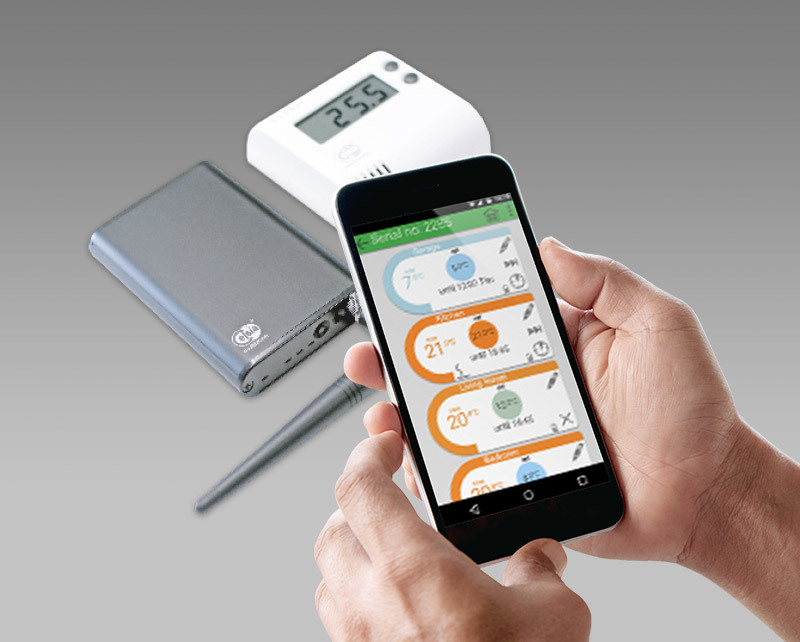 Manage and control your heating remotely over the internet from anywhere. Energy saving by matching heating to usage. Accurate and stable temperature control. System can easily be extended to control up to 10 zones. Quick to fit, easy to operate and programme. Wireless connection between the zone thermostats, radiator and gateway means that installation is simple. Multiple radiators can be connected to one zone thermostat, making the system expandable and flexible. 7-day programme to meet lifestyle needs. Multizone alerts – over and under temperature. Temperature sensor and local control sited away from the radiator using the wireless zone thermostats providing accurate room temperature and ease-of-operation. Gateway – plugs into your existing router. Thermostats – one required per room/zone (multiple radiators can be controlled by one zone thermostat). Signals between the gateway, thermostats and radiators are all wireless. Up to 10 rooms/zones can be supported by the system. The RadiWarm has 100% efficiency. 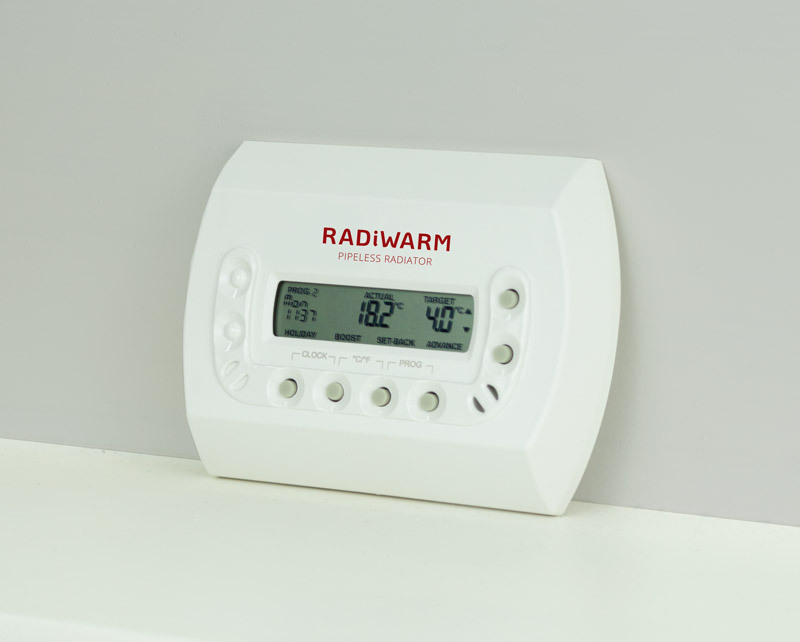 Once a room reaches the desired temperature, the RadiWarm’s Smart Heating software will switch to eco-saving mode to maintain ambient room temperature – only needing to pull electricity when required. The RadiWarm is a true plug and play radiator. Mount it to your wall, plug it into a nearby standard mains electricity socket and enjoy the heat of a real water-filled radiator. Or take advantage of our installation service where we will install the RadiWarm for you. 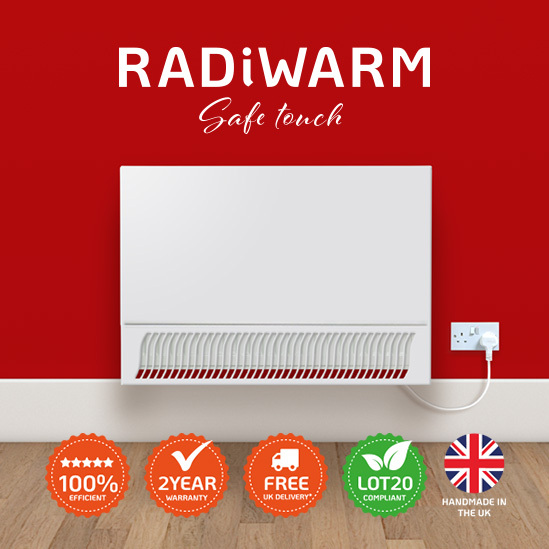 If you need permanent heating in a space where plumbing or a gas supply is not an option, the RadiWarm is the best and most efficient solution. Hand-built in the UK, ideal for the whole home but especially for loft-conversions, conservatories, apartments and listed buildings.